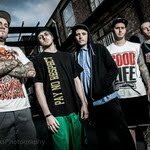 London's No Second Chance are joining the Rucktion familia! Those hard-working boys have been touring the UK and Europe relentlessy for the past few years and they're about to embark on their first US tour. They'll be recording a brand new EP next month with Stu McKay (50 Caliber, Brutality Will Prevail etc.) for release on Rucktion in the next few months. This follows up their split with Beater and their well-acclaimed debut full-length "Never Ending Fear".